JSON data doesn’t need a JSON datatype. JSON data can be loaded in the already existing datatypes for string like: VARCHAR2, NVARCHAR2, CLOB, etc. The JSON data is available afterwards via the new functions and operators like: JSON_TABLE, JSON_VALUE, JSON_EXISTS or IS JSON. 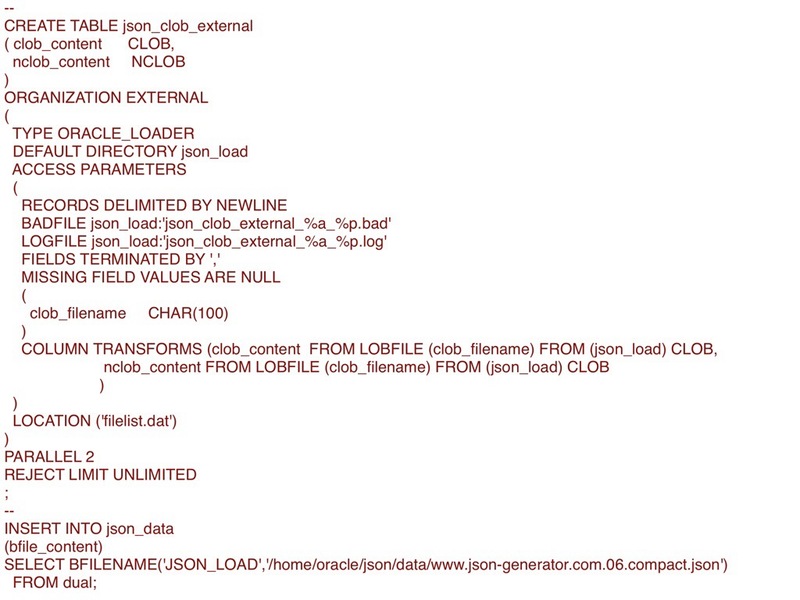 With the latter, IS JSON, can a table be restricted on STRICT or LAX (lazy) mode to allow or disallow JSON data only. For example a table can have on column level a IS JSON constrain which restricts this column to be contain JSON formatted data only. For example, the following table definition demonstrates multiple strict, lax, JSON syntax examples on column level. The default, when the level is not mentioned, is lazy JSON handling. Also in SQL this condition, JSON data or not, can be checked via the following construct. Besides loading JSON data like you used to like loading strings in varchar2 columns, you can also load it in CLOB columns which probably is more useful being not restricted by 4000 characters or 32K. Hope to be of help with your first steps handling JSON data natively in your 12.1.0.2 database environment.